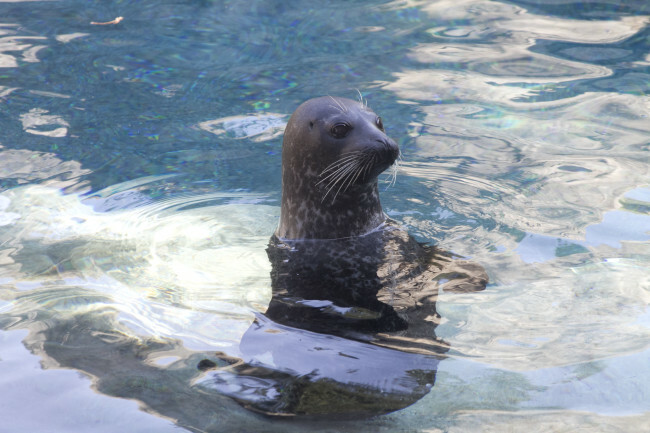 The Harbor Seal is a small seal, but the rounded, short-muzzled head and spotted coat are quite distinctive. The eyes are very large and the front flippers short. The nostrils form a wide “V” and the ear openings are inconspicuous, with no external pinnae ‘ears’ as seen on Otariids. There is no obvious sexual dimorphism. Phocids like cold coastal waters. In the northern hemisphere Atlantic they range south to Cape Cod and France, and in the northern Pacific, to Baja California and Japan. Marine Harbor Seals are often seen great distances up coastal rivers. They prefer shallow water and sandy beaches. They only utilize areas of the Arctic that are free of ice in the winter. There is a fresh-water subspecies in Lower Seal Lake and some other lakes on the Canadian Ungava Peninsula, 150 km east of Hudson Bay, at an elevation of 250 meters (@ 750 feet) above sea level. Wild – Various coastal fishes, cephalopods and crustaceans. Zoo – Mackerel, sardines, squid or other fish, supplemented with vitamins and sea salt. Light gray to gray-brown, Harbor Seals have rings or spots that may be light on dark or dark on light. Newborn Phocids generally have a white to yellow woolly coat, which is molted over their first few weeks. Harbor Seal pups, however, may molt their white woolly fur in utero or at birth, although the NW Pacific subspecies that births on drifting ice retains the woolly coat longer. The adult coat is stiff and short with no undercoat. Seasonally monogamous, Harbor Seals are seldom seen in large groups. Spending most of their time in the water, all that is usually ever seen is their heads bobbing in the swells just outside the breaking waves in a behavior called ‘spy-hopping.’ Along California they like the kelp forests. Limited haul-out sites or an aggregation of food species may be the only reasons for group formation. If they do haul out together, they do not touch each other. They are very wary when on-shore. Little is known about their non-breeding socialization or other behaviors. Solitary species of pinnipeds, like Harbor Seals, are generally not very vocal. Harem-forming species, like Elephant Seals (Mirounga species) and Sea Lions, are exceedingly vocal. Juvenile seals cannot swim well and must learn by emulation and practice. They will often frolic in tide pools and vernal rain pools, gaining skill. Both pups and adults may be seen, on haul-out sites, in the “banana” position, with both head and tail ends raised. This apparently aids in keeping cool. When True Seals swim, they power with the hind limbs and their lumbar spine is unbelievably flexible. They steer with the short front flippers. Because their front flippers cannot reach the ground, True Seals motivate on land with the classic “inch-worm” action of stomach hunching called undulation. Despite the clumsy appearance, these seals are quite fast for short distances. The fore flippers are well furred and there are claws on the toes, which are used in grooming. Blubber is a specialized fat-layer just under the skin. It serves as padding and insulation against the cold, as well as for buoyancy and a fat reserve against starvation. There is a rete mirabile, a “miracle net” of capillaries and larger blood vessels, in each flipper. Body-core heat is conserved when warm out-flowing arteriole blood passes through a capillary bed that wraps around the in-coming veins. The arteriole blood is cooled as it warms the chilled in-coming venous blood. The flippers are maintained at water temperature and very little body heat is lost. Blubber is, of course, a detriment on-shore and pinnipeds must regularly go into the sea to cool off. True seals can go straight from lounging on the beach to a dive over a ¼ mile deep. They can stay down for over an hour. As with all marine-mammal divers, true seals have certain physiological adaptations. In a dive, the heart and metabolic rates are slowed, the body temperature drops and the lungs collapse, expelling almost all air. They have myoglobin, giving them the ability to store large amounts of oxygen in the muscle tissues, and they have an extreme tolerance for high carbon dioxide levels in the tissues. The large eyes are designed to change focus, adjusting to the different refractive indices of air and water. Fairly sedentary, these mostly solitary seals do no form harems. They do begin to gather in small, mixed groups in late summer. The loose groups show no hierarchy. Mature seals (about 5 years old) pair up and, in September, swim off to secluded areas where they generally breed in the water. “Monogamous” is sometimes applied to them, but it is miss-leading. The females mate with one male and are done with the breeding season, heading back to sea soon afterwards. The marginally larger males are opportunistically promiscuous but defend no territory or harem group. Harbor Seals winter at sea, the females coming in-shore again to give birth in spring. Delayed implantation can make the apparent gestation 11 months, but one pup (occasionally 2) is born after a 220-day gestation. Pups often enter the water within hours of birth. They are weaned at about 6 weeks, will disperse after following the mother for a time. Longevity is about 35 years for females, 25 years for males and longer with captive animals. Lifespan Females typically outlive males (30–35 years versus 20–25 years). Length Up 6.1 feet in length. Weight Up to 290 pounds. Diet Includes Cod, Herring, Salmon, Octopus, Rockfish and Squid. Habitat Found in coastal waters of the northern Atlantic and Pacific oceans, the Baltic and North Seas. Once rare, Harbor Seals are currently protected, in USA waters, by the Marine Mammal Protection Act (1972), and their numbers are back up after heavy persecution from fishermen and other hunters. Currently, they are IUCN listed as Least Concern, but are heavily impacted by industrial and agricultural pollutants (both directly and in the food chain), as well as disease and predation from feral dogs, because of their close proximity to large human populations. Off-shore wind-power generators cause increased activity, noise and ground vibration that may adversely affect either the seals or their prey species. More data are needed to assess the impact of these generators. Harbor seals use oxygen already in their blood and muscles while under water, and their heartbeat slows from about 100 beats per minute to 10.